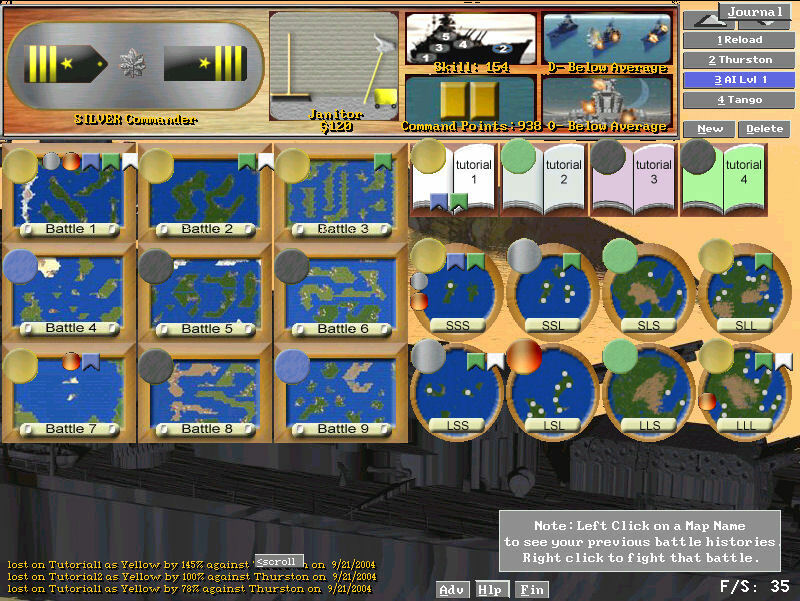 Help Save the Admiral in this deep thinking strategy naval game as you battle your opponent for control of the oceans with Battleships, Destroyers, Submarines, Carriers, and other ships. The quick playing, turn based action constantly challenges you with knife-edge decisions and planning that feels almost chess-like at times. Out think and out maneuver your opponent to bring victory to your side! Games last for a certain number of turns. 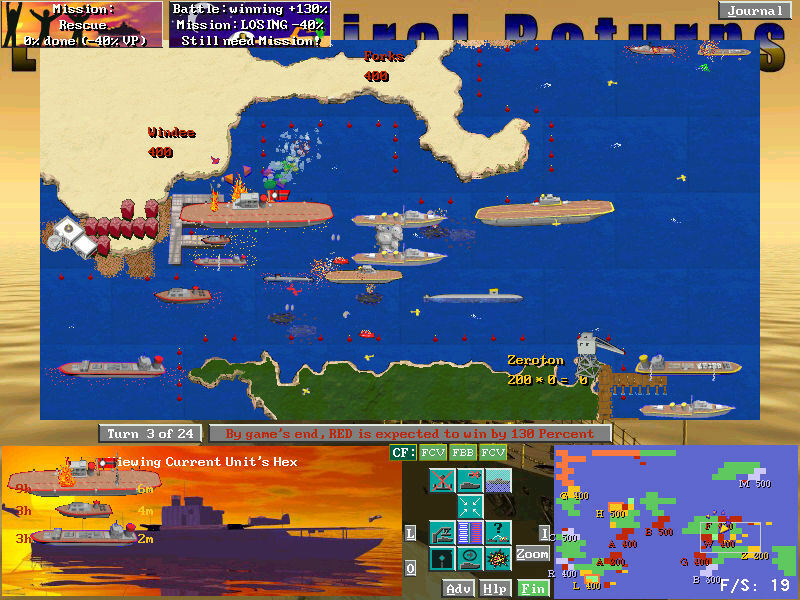 Each turn move your ships to capture cities and to fight the enemy. Earn victory points every turn for each city under your control. The winner is determined by comparing victory point totals at the end of the game. Some maps have starting setups for each side that favor one player, requiring that player to score quite a few more victory points than the other player to win! The inspiration for this game is “Lost Admiral” which Thurston originally created with the now long dead publisher QQP back in 1991 and was so simple that it ran off 5 ¼ floppy disks, and was designed to be playable off of those disks for those people who did not have a hard-drive on their computer… talk about ancient history, grin! 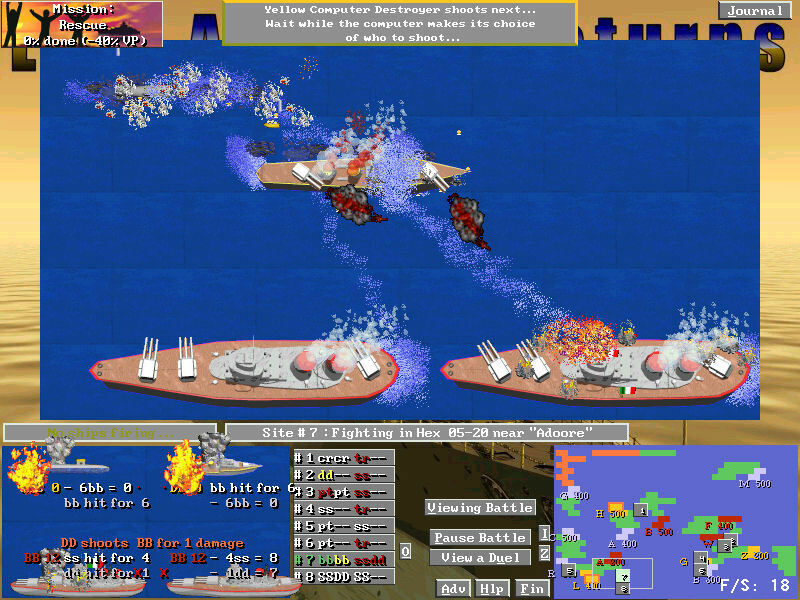 The original Lost Admiral won "Strategy Game of the Year" from Computer Gaming World Magazine in 1992. The new Lost Admiral Returns retains the spirit and deep, simple game play of the old Lost Admiral, with totally new layers of interwoven missions and challenges that build up the story of Saving the Lost Admiral. None of the old code or graphics were modern enough to use in LAR, so the game is entirely new, and direct marketed over the Internet as “Try before you Buy” software with a 30 day trial period.